When working in a warehouse, factory or other industrial premises you are likely to come across the use of a forklift. Safety when using a forklift truck is of the utmost importance, not only to you but colleagues. 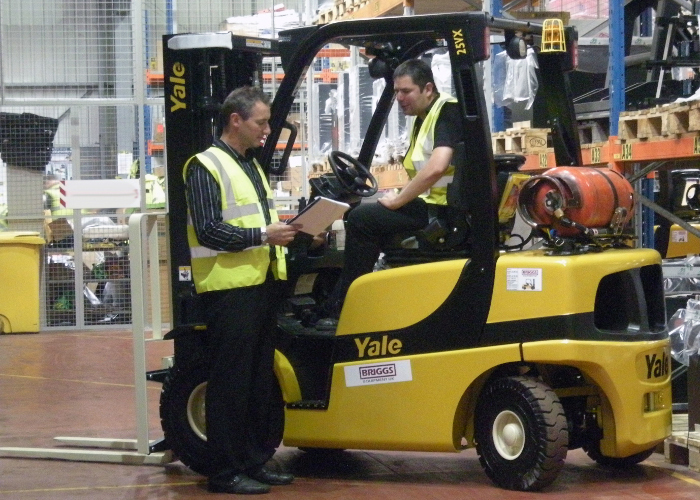 To operate a forklift you must undergo the necessary training and testing, once you have passed you will be given a licence to operate the forklift. Also make sure that the clothing is fitted but not restrictive. When operating the forklift it is imperative that you stay away from uneven or loose ground surfaces as well as slippery conditions. Make sure you keep a safe distance from other trucks in the vicinity and give plenty of room when you are manoeuvring. When you are going round a corner it is advised to sound your horn so people know you are approaching. Before you move double check that your load is secure and stable and not likely to come loose or topple. Clear visibility When manoeuvring the load into racking or up a ramp make sure that you have clear visibility and your view is not obstructed so you can see completely what is going on and make quick adjustments if need be. You must always drive up ramps in a forward direction; you should never reverse up a ramp. You should also never unload or load good on a ramp. When you are finished operating the forklift make sure that it is returned to its designated area, that the forks are lowered and the park brake is applied and that the forklift is switched off. You should never leave a forklift running unattended. Forklift trucks can take a number of attachments, from drum rotators, tines, spreaders and of course forklift cages. Forklift cages are designed to aid in access to high racking and storage areas making it safe and easy to reach goods or equipment. Here are a few guidelines to follow when operating and using a forklift cage. If the cage gas full safety it is not mandatory to wear a safety harness, however it is down to the discretion of the user to assess the situation and wear if they feel it is needed. ESE Direct supply a range of forklift cages, if you have any questions regarding these please call our friendly and award winning customer service team on 0808 163 3704, or you can chat to them online using our LiveChat! service.